Valentines are so special that many people collect them. These Valentines are much older than you. Theyre as old as your great-grandparents. School kids gave these to their teacher in the 1920s and 1930s. Remember this: no matter the time or the language, I Love You is still the same. Do you know who loves you? Did you guess? Your right, its me. More now than ever. Its true. Fold a piece of construction paper in half. Cut out a half heart shape. Open the heart and write your own poem. Finish with decorations and give a great big smile to your special person. Saturdays (10:30am)-Old Maryland Farm promises an afternoon of fun: a hayride and visits with farm animals. Watkins Regional Park, Upper Marlboro: $2: 301/249-7077. 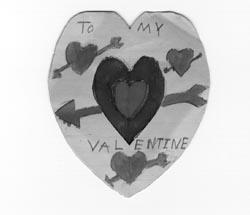 Fri. Feb. 11 (10am)-Decorate a Valentine and enjoy a sweet treat while listening to Cliffords First Valentines Day. Barnes and Noble, Harbour Center, Annapolis: 410/573-1115. Sat. Feb. 12 (10am)-For a new twist on a beloved fairy tale, enjoy the Annapolis Opera production of Little Red Riding Hood. Maryland Hall for the Creative Arts, Annapolis. $10 adults, $4 kids: 410/267-8135. Tues. Feb. 15 (10:30-12pm)-The park is full of furry friends, but where are they hiding now? Have fun with crafts and enjoy a special treat as you discover where they sleep and how they survive. Kings Landing Park, Port Republic. Ages 3-5. $3; rsvp: 410/535-5327. Fri. Feb. 18 (6:30-7:30pm)-Kids, cant get enough of the computer? Bring your parents to a computer spring open house. Learn about 4 classes being offered this spring. Anne Arundel Community College, Johnson Building Room 106, Arnold. Ages 5-7: 410-315-7259. Thurs. Feb. 17 (10:30am)-Check out local wildlife in live demonstrations. Tawes Garden, Annapolis. rsvp: 410/260-8189. Fri. Feb. 18 (10:30-11:30am)-Learning the special ways ducks and geeselive in the wild. Patuxent Wildlife Research Center, Laurel, Maryland. Ages 5-7; rsvp: 301/497/5887. By Feb. 25-Get out your paints or crayons and show the Annapolis Symphony Orchestra what music means to you. Artwork must be on 8 1/2 x 11 white paper & submitted by February 25. Winning art displayed at the ASO Family Concert Sunday, March 12. Winner receives a Maryland Hall art class and supplies from Art Things. Send to Pamela Chaconas, 801 Chase Street, Annapolis, MD 21401. Include name, age, address, and phone number.